1993 - 1996 Cadillac Fleetwood Center Cap DAMAGED 15" Web Design rim J1 7.365"
This item looks nice on a daily driver; has a nice shine' but shows usage (see photos). This has a part number of 25558415 25550017 25558415 & 25534185. This will attach on good or your money back. I HAVE THE SETS IN BLACK & GOLD BLACK& SILVER.THEY ARE PEEL AND STICK CENTERS. 1993 CADILLAC FLEETWOOD -RWD, 15x7 (aluminum), web design. 1994-1996 CADILLAC FLEETWOOD - 15x7 (aluminum), web design, brushed finish. THIS CENTER CAP IS IN GREAT OVERALL USED CONDITION. THERE IS TYPICAL MILD SCRATCH/SCUFF WEAR ON THE CENTER EMBLEM, FOR A PART THIS AGE. ELDORADO 89-91 15x6, aluminum, lace design. DEVILLE 89 15x6, aluminum, lace design. DEVILLE 90 15x6, aluminum, standard duty, opt WCM. DEVILLE 90 15x6, aluminum, standard duty, opt WCS. DEVILLE 91-93 15x6, aluminum, lace design, standard duty, opt WCM. This center cap is for the 1993-1996 Cadillac Fleetwood with the 15x7 lace design aluminum wheel. It is used and as you can see it has typical wear & tear / nicks / scratches etc. Fits 1993-1996 Cadillac Fleetwood Lace Design 15x7 Aluminum Wheel. Here we have an OEM Cadillac hubcap center cap in silver color; Parts Number 25536914. We believe these were pulled from a Cadillac Deville or Fleetwood, anywhere from the year 1991-1993. This is in used condition. I have a good USED 1991-93 Cadillac Deville/Fleetwood alloy wheel center cap, part# 2553691. 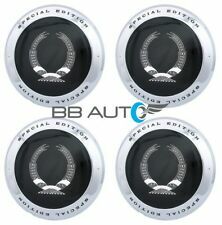 Application: 1985 - 1988 Cadillac Fleetwood FWD 14 Aluminum Wheel Center Hub Cap. 1985 - 1988 Cadillac Deville FWD 14"Aluminum Wheel Center Hub Cap. This center cap is for the front wheel drive car only. Up for grabs is a center cap for a Cadillac Deville or Fleetwood. It is part number25558415. This one has the silver background. The more common version had a black background. It will fit the lace type wheels pictured for reference. Excessive Pitting deep in the plastic emblem. Part #25558415. 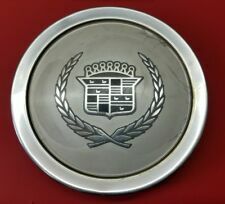 Cadillac OEM Center Cap In Very Good Used Condition. 1989, 1990, 1991, 1992, 1993, 1994, 1995, 1996 and may fit others. MACHINED RING / SILVER CENTER / COLORED CREST. It's in very good condition!The center emblem has a few spots on one side, as seen in the pics. 91-93 Deville. 91-93 Fleetwood. 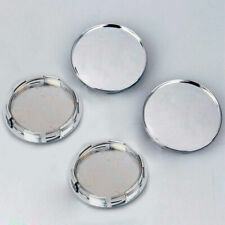 - Make sure the finish of this item matches your center cap before purchasing. The GM part number is 1649071. 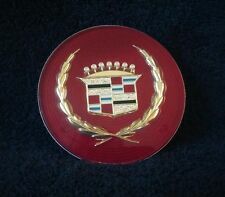 Cadillac Center Cap #1649071. We have the ability to accept your credit card over the phone. Trending at $39.95eBay determines this price through a machine learned model of the product's sale prices within the last 90 days. Fits: 1989-1995 Cadillac Deville. 1989-1993 Cadillac Fleetwood. 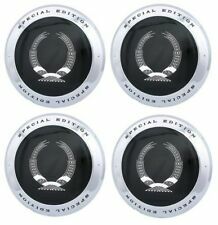 ONE SINGLE NEW SPECIAL EDITION CADILLAC WHEEL CENTER CAP. 1989-1991 Cadillac Eldorado. 1989-1991 Cadillac Seville. 1994-1996 Cadillac Concours. 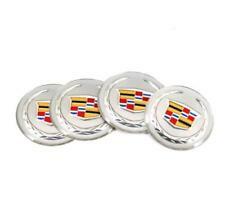 SHOW YOUR CADILLAC PRICE WITH THESE. NEW IN BOX. DON'T LET THEM SLIP AWAY. 1991-93 CADILLAC DEVILLE-FLEETWOOD CENTER CAP, NOS CENTER CAP, SILVER, NO CRACKS, USED ALUM. - Highway 212 Classic. One (1) 89-93 Cadillac Deville / Fleetwood center cap part number 25534185 or 25534364. 1990-1993 DEVILLE. 1990-1993 Fleetwood. Always COMPARE the part number on this cap to the part number on the cap from your vehicle. Part numbers are stamped on the back of the hub cap or center cap. Year: Make / Model: 1991 1992 1993 Cadillac Deville Fleetwood set. THESE ARE USED AUTO PARTS WE DO OUR BEST TO CLEAN THEM BUT THEY MAY REQUIRE A LITTLE FURTHER CLEANING ONCE RECEIVED. 1994 THROUGH 1999 SEVILLE / DEVILLE. Part # 25536914. Should fit Cadillac DEVILLE FLEETWOOD Wheel 12507129 for year s 1991, 1992, 1993. 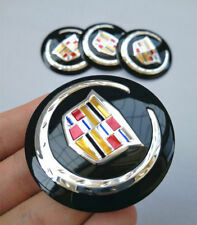 Cadillac Center Cap In Very Good Condition. See Example Photos. DONOR VEHICLE : 1996 CADILLAC. Our Yard Receives 50 cars daily and we are struggling to keep all cars on our location for longest before disposing of it. Get more For Less. We are human and make mistakes too. 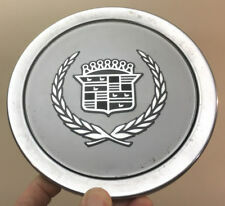 Here is one used oem Cadillac center cap. It goes to the 1993 to 1996 models with 15 inch web design wheels. This center cap is used and has nicks and scratches but it will look fine on your wheel. Please note that there is a bruise on the edge. Please see pictures. You will receive the center cap in the picture. All of the mounting clips are perfect. Please be sure that the part number matches yours exactly. This auction is for one center cap only. Thanks for looking. Trending at $11.00eBay determines this price through a machine learned model of the product's sale prices within the last 90 days. Part number: 25534185 / 25534364 Z-24446. Also fits several model Cadillac rims. If you are buying a set call your dealer to confirm the compatible part number for your vehicle. HARD TO FIND STYLE CAP! THEY ARE USED DRIVER QUALITY MINOR WEAR AND SCRATCHES. SEE PICTURES FOR PART DETAILS AND COMPARE TO YOUR VEHICLE APPLICATION. Manufacturer Part #25613716. Part Number: 25613716. Hollander #4513. Hollander Wheel Number: 4513. Cadillac Deville: 1993-1995. Cadillac Fleetwood: 1993. It is 100% structurally sound. You may receive the center cap pictured or one in a similar condition. Part #10172913. Cadillac Center Cap In Good Driver Condition. 1991-93 CADILLAC DEVILLE-FLEETWOOD CENTER CAP, BLACK/SILVER, NO CRACKS, USED ALUM. - Highway 212 Classic. This center cap is for the 1991-1993 Cadillac Deville with 15" 28 slot aluminum wheels only. Fits 1991-1993 Cadillac Deville with 15" 28 Slot Alumiinum Wheel Only. (1) Single Center Cap. Suburban Wheel Cover has been serving the automotive industry since 1980. Nice shape hubcap, tabs fit tight into well of rim. light scratches and wear from 20 years of use, but 100% useable. decent coloring. New in box, genuine GM, Cadillac center cap. Hollander Interchange Number Wheel that this center cap fits is 1429 14x6, 5 lug, 115 mm. Cadillac Center Cap #1628618. We have the ability to accept your credit card over the phone. This listing is for 1 center cap. Fits 93-96 Cadillac Fleetwood. Condition is good with some light dings and scratches. See pics for more description! Check part number before purchasing. NO REFUND FOR WRONG PART. Thanks for looking! Fits 1989 Deville, 1988 Eldo, 1989 to 1991 Fleetwood, or 1988 to 1991 Seville. Part number 700 ?. Condition is used. Actual item you will receive is pictured. YOU WILL RECEIVE THE HUBCAP IN THE PICS. You will receive ONE used cap. LOOKS LIKE COLOR IS BROWN OR DARK BROWN.